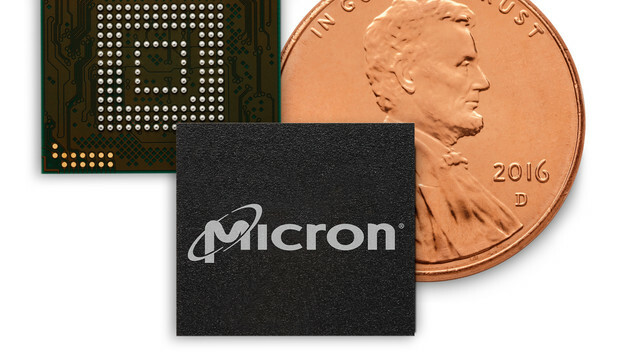 Micron today announced it is sending samples of its first 3D NAND flash memory to mobile device manufacturers, and said the new embedded storage is the industry's densest and highest performing. The new Micron Mobile 3D NAND will ship in four distinct 32GB memory cards, two of which will use the latest Universal Flash Storage (UFS) 2.1 standard. That standard offers 33% higher bandwidth over previous Micron mobile flash products. The other two products will continue to use the more traditional embedded embedded MultiMediaCard (eMMC) 5.1 interface. The new 3D NAND flash cards will offer up to 600 MBps sequential reads and 20,000 random input/output per second (IOPS) -- a 40% improvement over previous Micron mobile flash products. The 3D NAND flash cards will be targeted specifically at the mid- and high-end smartphone markets, which Micron said make up approximately 50% of worldwide smartphone volume. The memory is Micron's first mobile flash built on floating gate technology that uses UFS 2.1, which it said offers better performance, quality and reliability than past solid-state drives. "The benefit of floating gate flash technology is endurance and reliability," said Dan Bingham, a spokesman for Micron's Mobile Business Unit. "That'll be a selling point with this product. This is a very reliable product, and it's a cost effective way of producing it. This gives us a nice foundation to build on for 3D NAND until we get to our next version." A depiction of Micron's 32-layer 3D NAND flash memory using floating gate technology. UFS-based memory devices are now becoming a more mainstream interface in the mobile market compared with eMMC. Micron is touting its mobile flash memory's ability to offer smoother ultra-high definition video streaming, more efficient multitasking and reduced power use. The UFS interface has 33% higher bandwidth than memory with the eMMC 5.1 specification used in most mobile devices today, according to Bingham. "If you look at the marketplace, 50% of memory bits are consumed by mobile devices, so from that standpoint this is a very strategic business for us," Bingham said. Three dimensional NAND is being manufacturing by virtually all flash makers today, including Samsung, Toshiba and Micron development partner Intel. Earlier this year, for example, Samsung Electronics, began mass producing the industry’s first 256GB embedded memory based on the UFS 2.0 standard, for the "next-generation high-end mobile devices." Two dimensional or "planar" NAND flash is bumping up against a density wall that will not allow it to increase storage capacity much further. "This is our foray into 3D space for mobile, but it's not like we're talking about new technology," said Gino Skulick, vice president of marketing for Micron's Mobile Business. Micron's 3D NAND stacks 32 storage cells to achieve the NAND die available today in 256Gb multilevel cell (MLC) and 384Gb triple-level cell (TLC) 3D NAND. Micron's 3D NAND for mobile device product line. 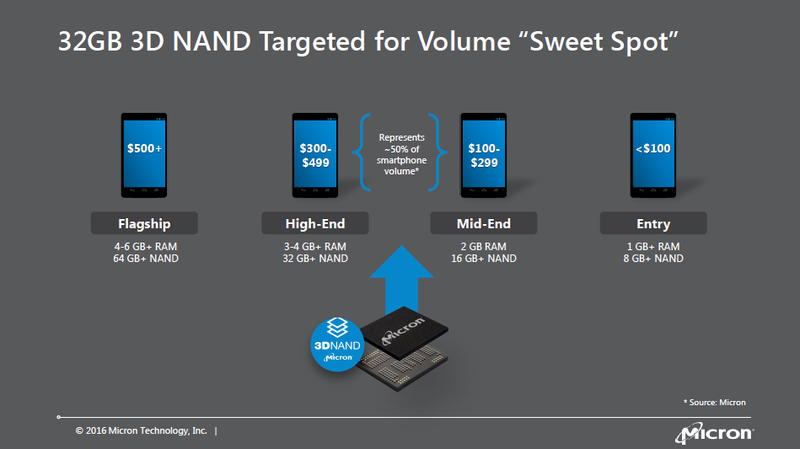 "This NAND will be the smallest in the industry," Bingham said. "The benefit of that is it can be put into a smaller package freeing up space and ultra-small form factors for things like wearables; that's a great target product for this. You can do a lot in a very small space. "Will we go to 64 tiers [in 3D NAND]? Absolutely," Bingham continued. "That's what we're calling Gen. 2, but I don't know that we've announced the timing for that yet." The new Mobile 3D NAND is based on Micron's 8GB 3D NAND die, which is made up by 32-layers of NAND flash cells stacked like a microscopic skyscraper. The die measures just 2 3/8-in (60.217mm) square. Micron's 3D NAND card also includes the company's first low power LPDDR4 RAM; Micron claims it's up to 20% more power efficient than standard LPDDR4, which uses 1.1 to 1.2 volts during writes. Micron's new 3D NAND mobile flash chips. The 3D NAND chips are now sampling with mobile device manufacturers and chipset partners for qualification with broad availability expected in the second quarter of 2017, Micron said. "As mobile devices bypass personal computers as consumers' primary computing device, user behaviors heavily impact the device's mobile memory and storage requirements," the company said. "Micron's mobile 3D NAND addresses these concerns, enabling an unparalleled user experience that includes seamless high definition video streaming, higher bandwidth gameplay, faster boot up times, camera performance and file loading." The UFS 2.0 specification, released in 2013, offers a multi-lane, serial bus versus the single-lane, parallel bus used in today's eMMC flash. That means that instead of a single lane for reads and writes, data can move in both directions at the same time -- greatly improving bandwidth. The UFS 2.0 specification boasts up to 600MBps of throughput, but because it can use two serial lanes, it has a total of 1200MBps, or 12Gbps. That compares with the eMMC 5.0 spec, which has a 400MBps maximum performance over a single parallel bus.